Choosing the right kitchen floor is not easy. You want the floor to be pretty but it also needs to be functional. Unlike a bedroom or living room where you sit on a furniture, kitchen is a place where you stand and are constantly on the move. The floor surely needs to be more sturdy and should be able to handle the splashes, spills and falls that are bound to happen in such a busy work space. It is no doubt, that your kitchen floor endures greater hardship than other rooms (except maybe the bathroom), therefore it is important to choose a floor that would be able to take it all and still look presentable. Here we present some best options to suit your taste that are not only practical but beautiful too. 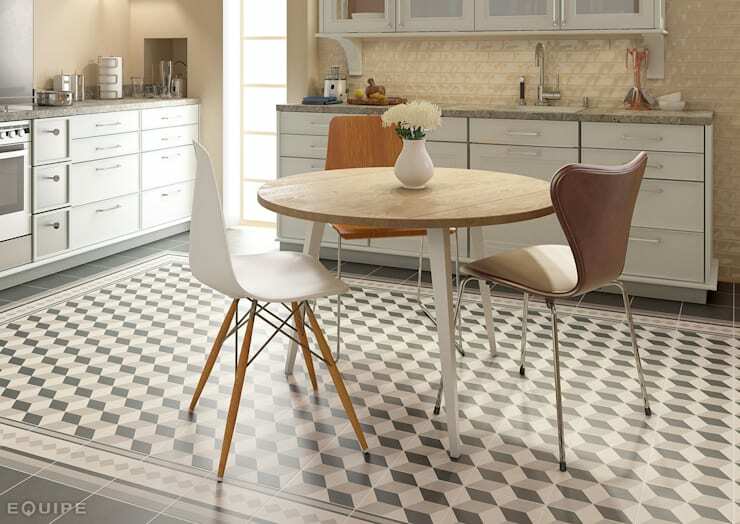 Tiles are the most popular choice when it comes to kitchen flooring and reasons are many. 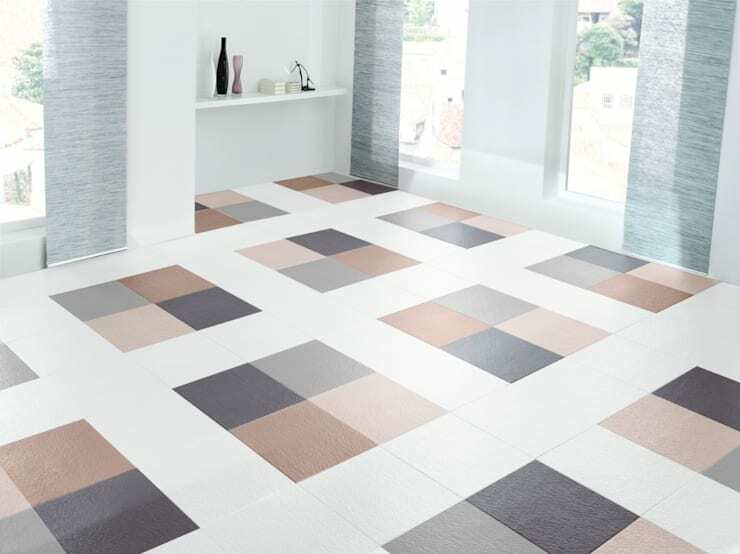 Tiles are available in a wide range of designs and colors. The options are limitless, from colors to textures and patterns, you can create a sober to quirky look by installing the tiles of your liking. Tiles are also very robust to breakage due to things falling on them. Good quality tiles won't easily crack because of heavy pots or pans accidentally landing on them. The best part however, is that tiles are super easy to clean. They are resistant to most chemical cleaners and wont chip or become abrasive due to constant scrubing. Tiles are durable and easy to maintain. Good quality tiles are glazed, are abrasion free and last a lifetime. Invest in the best that you can afford and you won't complain for many years to come. PVC floors are the next best thing when it comes to low maintenance. 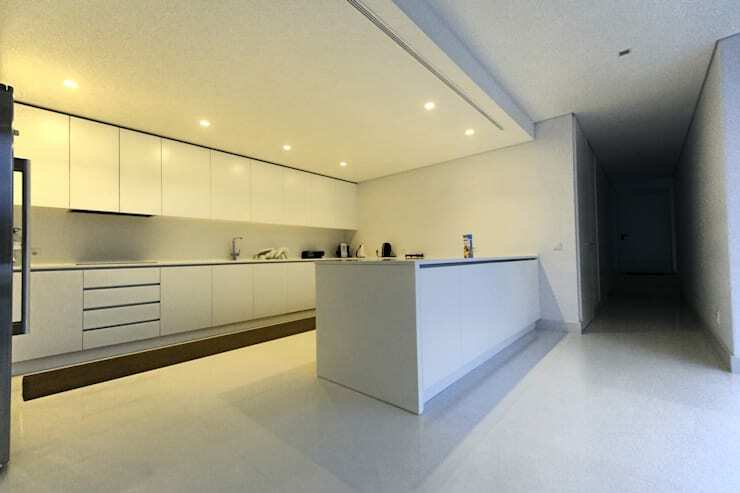 In fact PVC floors may be more appealing to people who want quick and low cost kitchen floors. PVC floors are just as easy to clean as a tiled floor and resistant to most chemical cleaners. The latest variants of PVC are even more long lasting and are available in a wide range of patterns and designs. PVC sheets are shock absorbing too, so your neighbors and occupants below your flat would be quite pleased with them! If PVC makes you think of plastic and unnatural, then maybe its time to browse through some amazing PVC floor options available today. You'd be surprised how elegant and sophisticated PVC can look. If PVC still doesn't convince you and you prefer a more natural material then Linoleum is a worthy alternative. It is often considered a natural floor covering as it made of materials such as linseed oil, cork or wood flour and jute. This combination of raw materials makes Linoleum floors anti-skid, anti-static, anti-abrasive and easy to clean. Linoleum need to be professionally laid with care using the special linoleum adhesive. Anything otherwise would not look uniform enough and affect its longevity too. For added protection, a coat of silky-matte layer will prevent water from damaging the material. Because of it all natural composition, Linoleum is routinely opted for those with skin sensitivity and other allergies that may aggravate due to chemical based materials. Wooden floors lend an old world country charm to the rooms. When far away from the natural surroundings, bringing some elements of nature closer home, gives a sense of satisfaction to home owners. Though wooden floors have long entered the living room and bedroom, kitchen's were usually not considered the best contender for them. However with introduction of newer materials and technology, wooden floors can be easy to incorporate in kitchen decor as well. 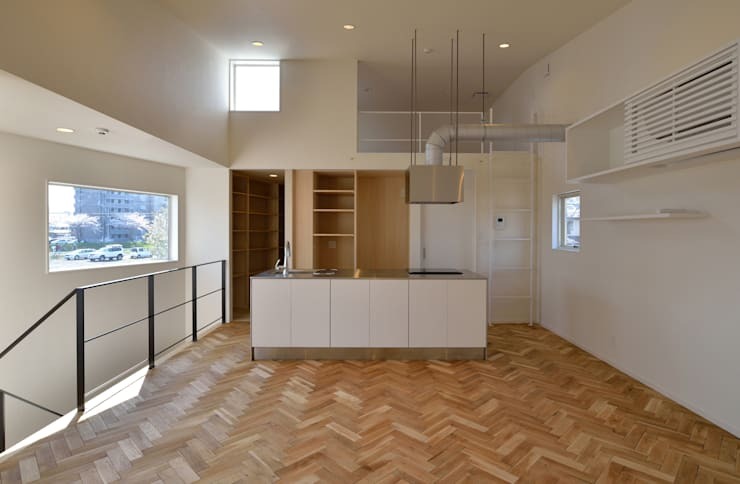 A parquet floor can uplift a kitchen to a beautiful intimate space in the house. The sheer contrast with a futuristic or industrial style for the rest of the kitchen can create a unique eye catching experience. Though wood cnanot be as easy to maintain as tiles, it need not be complicated too. Layering with a surface protective seal on the wood will make it more durable and resistant to the daily wear and tear. Tips: Always use surface guards when placing furniture on wooden floors and use contrasting colors for furniture and appliances against the floors as all dark can make the space look smaller. Check out some stunning all wood kitchens for more ideas. If real wood seems too much work but you still would like to have a wooden floor, then laminate is your next best alternative. It is remarkably more popular as it gives an exact wood-like finish sans the high maintenance and care. Laminates are essentially layers of wood parts such as chips and fibres that are compressed under high heat to make sheets with a digital imprint on top. These digital imprints can be made in different colors and patterns allowing wood finish in varied designs. Laminates are easy to install and easy to clean and care for. It is recommended that instead of wet wipe, just a damp wipe should be used to clean the floor. 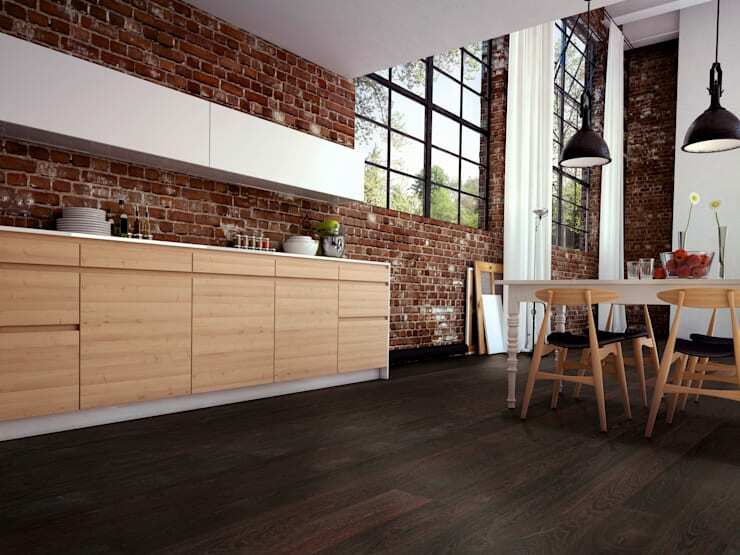 Tough laminates can withstand high impact falls and therefore becoming a favored kitchen floor tiling option. 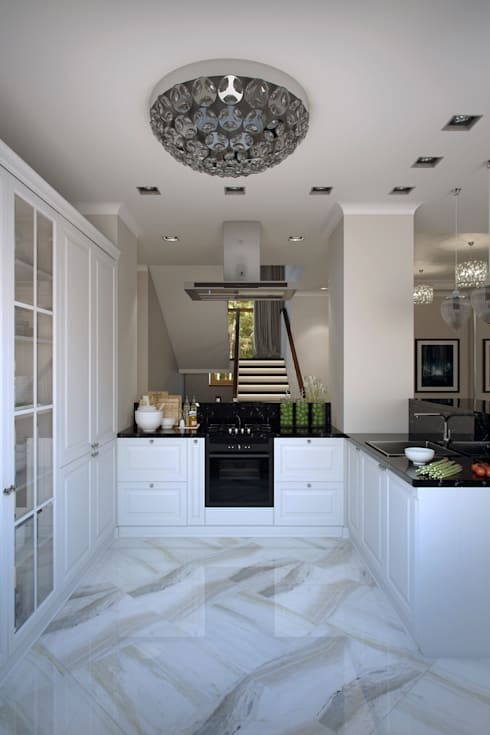 Natural stones are also quite popular as kitchen floors as they are known to be very sturdy. The all natural effect of a stone cannot be matched by man made tiles. Use of marble, and travertine is quite well known. However, when using natural stone, it is important to study the kind of climate and geography of the area. Some stones that are not native may not prove durable in the long run. Also, if the kitchen is on the ground floor, then the natural composition of the soil is important too. Though natural stone offers a sophisticated and unique look to the kitchen, one must be prepared to take good care of it. For example any water spill on a marble floor should be wiped dry immediately or it may lead to a permanent imprint. Also, chemical cleaners are best avoided as the can be highly abrasive to the stone.